Everyone has a ‘happy place’, somewhere you can escape to for a little R&R to chill and unwind. 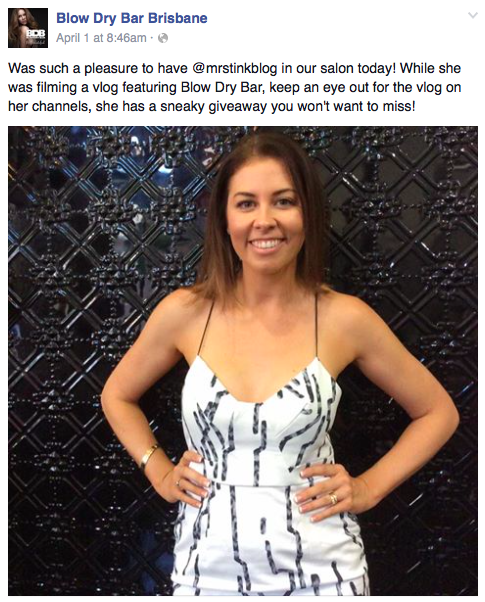 My happy place is the ‘Blow Dry Bar’, an uber cool salon in Brisbane City that specialises in… you guessed it, Blow Drys! This is a salon that truly understands the art of a good blow dry using a round brush resulting in lots of volume and shine that will blind you. These days’ hairdressers are quick to pull out the straightening irons, which don’t get me wrong I love, but nothing looks better than a blow dry that has been done the good old fashioned way. Despite my best efforts it’s something I’ve never been able to master at home, even with the best tools and products. Alas, a good blow dry is hard to find but I think I’ve found #thebestblowdryintown. From the second you walk into the salon you’re treated like royalty, greeted by their gorgeous stylists who are there to give you an amazing experience from start to finish. The moment I sat down I was offered a menu of drink options to start, one option being champagne! Who can resist 5 star treatment and a glass of bubbles to really soak up the experience? Each time I visit the Blow Dry Bar I’m always wowed by how something as simple as a glass of champagne can take the experience to a whole other level (if only other retailers took this onboard!) With champagne in hand we were ready to begin. The energy in the salon was like no other, the atmosphere and music makes you feel excited of what is about to come! 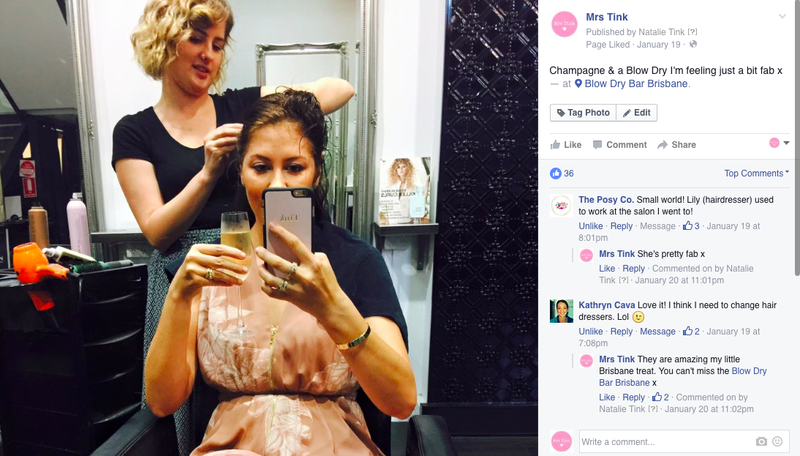 While the Blow Dry Bar in Brisbane City also offers the usual services you can expect to find in an upmarket salon, they have built their undeniable fabulous reputation on giving women like me more bounce and volume in their life. The signature blow dry consists of a wash, shampoo, condition with a head massage that will have you in a euphoric state and not wanting to leave. After all that bliss, you return to your station with your dream weaver aka stylist who begins to work her magic on transforming frizzy locks into a polished do. Using only the best in hair care products, they will have you feeling like a supermodel and ready to hop on the catwalk. 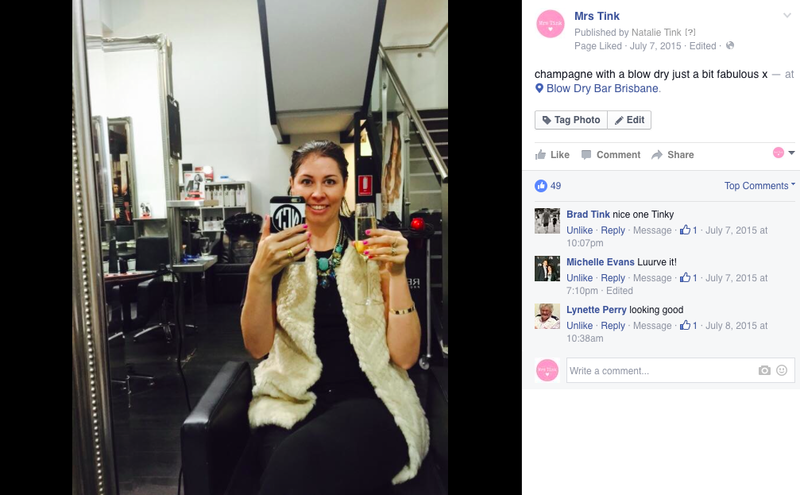 From start to finish the Blow Dry Bar offers a service like no one else, the team and concept is sensational. 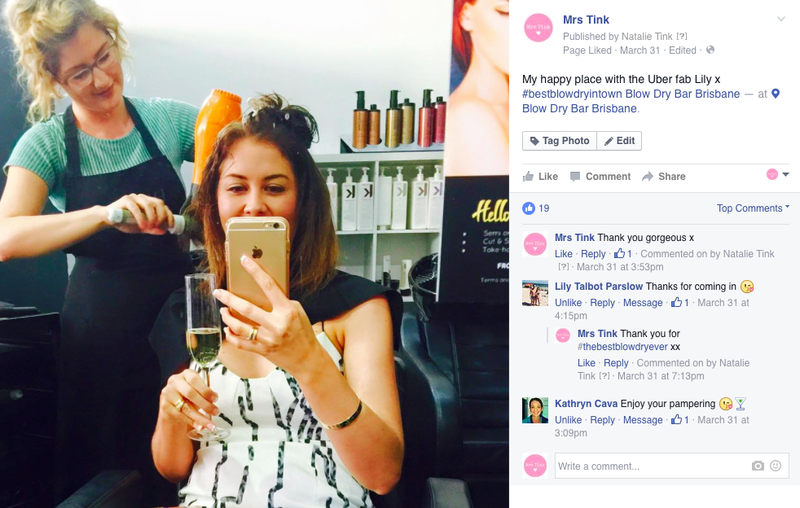 I’ve been visiting the Blow Dry Bar for many years now, it’s been a fave spot of mine in Brisbane and one that I never miss when I’m in town. If you’re in the CBD and ready for some pampering call the girls for a Signature Blow Dry – you won’t regret it. But be warned, the experience is addictive! Mrs Tink loves The Posy Co.